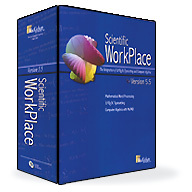 With Scientific WorkPlace Version 5.5, you can create, edit, and typeset mathematical and scientific text more easily than ever before. The software is based on an easy-to-use word processor that completely integrates writing mathematics and text in the same environment. With the built-in computer algebra system, you can perform computations right on the screen. In Scientific WorkPlace, you can typeset complex technical documents with LaTeX, the industry standard for mathematics typesetting. Because of its superior precision and quality, publishers and writers of scientific material use LaTeX extensively. When you typeset, LaTeX automatically generates footnotes, indexes, bibliographies, tables of contents, and cross-references. You don't have to learn LaTeX to produce typeset documents. Many of the more than 150document shells have been designed to meet the typesetting requirements of specific professional journals and institutions. Scientific WorkPlace automatically saves your documents as LaTeX files. You can concentrate on writing a correct paper; Scientific WorkPlace makes it a beautiful one. Scientific WorkPlace combines the ease of entering and editing mathematics in natural mathematical notation with the ability to compute with the built-in computer algebra engine,MuPAD® 3.1. In this integrated working environment, you can enter mathematics and perform computations without having to think or work in a programming language. The computer algebra system uses natural mathematical notation, so you don't have to master complex syntax to be able to evaluate, simplify, solve, or plot mathematical expressions. Full computer algebra capabilities are available. You can compute symbolically or numerically, integrate, differentiate, and solve algebraic and differential equations. With menu commands, you can compute with over 150 units of physical measure. You can import data from graphing calculators. In addition, you can use the Exam Builder provided with Scientific WorkPlace to construct exams algorithmically and to generate, grade, and record quizzes on a web server. With Scientific WorkPlace Version 5.5, you can create 2-D and 3-D plots in many styles and coordinate systems, and enhance the plots with background color, grid lines, and plot labels in specified locations and orientations. And with MuPAD's VCAM you can animate these kinds of plots: 2D plots in polar coordinates, 2D and 3D plots in rectangular coordinates, 2D and 3D implicit plots, 2D and 3D vector fields, 3D tube plots, 3D plots in cylindrical coordinates, and 3D plots in spherical coordinates and vector fields. View all your plots in the VCAM window with playback toolbar controls. Use your mouse to start, stop, re-run, and loop animations. Define an animation variable tfor your plot and specify the animation start and end times and the rate of frames per second. With OpenGL 3D graphics, you can rotate, move, zoom in and out, and fly through 3D plots. Scientific WorkPlace simplifies working with colleagues in other locations. Version 5.5 includes a new input filter for importing files created in native LaTeX. The filter can read many macro definitions not created in Scientific WorkPlace. The program also includes support for pdfTeX. Before passing your file to the pdfTeX processor,Scientific WorkPlace converts all the graphics in your file to a form that can be processed by pdfLaTeX. Also, documents that use the Hyperref package produce PDF documents that are fully hyperlinked, with links in the table of contents and with hierarchical bookmarks corresponding to the structure of your document. This combination of support for embedded graphics with a large variety of formats and full hyperlinking makes the PDF documents produced by Scientific WorkPlace superior both to the results of pdfLaTeX alone and to the results of Acrobat. When you use pdfTeX to print your document, you can use PostScript-related packages such as Rotating or the PSNFSS font packages that were previously unsupported in the program. Support for creating PDF files now combines with support for Beamer so that you can create typeset PDF presentations from your Scientific WorkPlace documents. Beamer support provides dynamic transitions and many predefined slide styles to help you create professional-looking presentations, handouts, and transparencies that contain text, mathematics, graphics, and even animations. Scientific WorkPlace imports text (.txt) and Rich Text Format (.rtf) files, and exports documents to RTF format for importing into Microsoft Word. The mathematics in your document are converted to Microsoft Equation Editor or MathType 5 format. You can create .dvi, .htm, .pdf, or .rtf files from your documents, or generate portable LaTeX output for seamless transfer to different LaTeX installations. Also, you can copy content to the clipboard for export as text or graphics to other applications. The Document Manager simplifies file transfer between colleagues by building all-inclusive document files, including plot snapshots and VCAM files. This software thinks like you do. Whether you prefer to use the mouse or the keyboard, entering mathematics is so straightforward there is practically no learning curve. Formatting is fast, simple, and consistent. In Scientific WorkPlace, you use tags to define the document structure and format it consistently. Users have reported significant productivity increases when support staff use Scientific WorkPlace instead of raw LaTeX to typeset documents. Both technical and non-technical users can quickly learn to enter and number equations, create tables and matrices, and import and create graphics, all with pleasing on-screen mathematics and italics created with TrueType outline fonts. Scientific WorkPlace has the tools that simplify writing and editing books and other large documents. It is perfect for writers in academic, industrial, and government institutions and in all scientific and technical fields: mathematics, physics, engineering, economics, chemistry, computer science, statistics, medical research, and logic. With the external lookup feature, you can access or run external programs, such as a search engine or other application, directly from your Scientific WorkPlace document. The software comes with an extensive online help system and a series of reference manuals. If you need additional help, MacKichan Software provides reliable, prompt, free technical support. Scientific WorkPlace simplifies working with colleagues in other locations. You can import text (.txt) and Rich Text Format (.rtf) files, and you can copy content to the clipboard for export as text or graphics to other applications. You can create .dvi, .htm, .pdf, or .rtf files from your documents, or generate portable LaTeX output for seamless transfer to different LaTeX installations. The Document Manager simplifies file transfer by email or on diskette. Spelling, font, and hyphenation support for languages other than English is available. You can switch languages in the same document using Babel, the multilingual LaTeX system. The software supports input using any left-to-right language supported by a version of Windows, including Chinese, Japanese, and Russian. It uses the in-place IME (Input Method Editor) for these languages. (The ability to typeset a language may depend on the availability of TeX for that language. Non-Latin character sets are typeset with Lambda, which is included.) Fully localized Japanese and Germanversions of Scientific WorkPlace are available now through our local distributors. Scientific WorkPlace has a built-in link to the World Wide Web. If you have Internet access, you can open the file at any URL address from inside the program. Also, you can deliver content via the Web. The software supports hypertext links, so you can facilitate navigation for your readers through a series of related documents. Readers can view and print documents using Scientific Viewer, which we distribute at no cost. © Copyright 1998 - 2014 MacKichan Software, Inc. All rights reserved.